Finally, consider the photo accompanying this post. 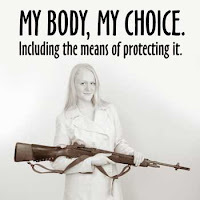 Notice how the rhetoric of the reproductive rights movement has been co-opted by the gun rights movement? Look up co-opted here if you don't know the meaning of the word. As you examine these ads, some of them vintage, but most of them contemporary, consider the sociological implications. For example, how would critical power conflict theorists analyze the ad claiming that the original gun control laws were designed to protect members of the KKK from black people? What would symbolic interactionists say about the ads for pink assault rifles marketed for girls? Structural functionalists might muse that society was on the verge of spinning out of control if despised groups became armed while social institutions like religion and the economy had not yet adjusted. I'm looking forward to discussing the issue of shifting gun marketing practices in class with you all.